Benfica's best display of the season thus far was not enough to overcome the Greek champions and the night ended in defeat, thanks to Benfica's own alumnus Roberto. The goalkeeper put on a one-man show and delivered the result singlehandedly, frustrating the Portuguese team's numerous attempts on goal. The night ended in defeat and an almost certain early exit from the Champions League. Even though the Eagles were far superior in every aspect of the game, Roberto's incredible display was the difference in the final result, ensuring Olympiacos' first clean sheet in nine matches in Europe's major competition and a fourth home victory on the trot against Portuguese teams. On the other hand, it meant that Benfica have now won just three of their last 20 away matches, although even the most demanding supporters will find it hard to point a flaw in the display from Jorge Jesus' men. Jesus seems to have decided to go with a more evenly balanced formation for European evenings, this time playing a clear 4x3x3, with Matic as the sole holding midfielder and Ruben Amorim and Enzo Pérez ahead of the Serb. 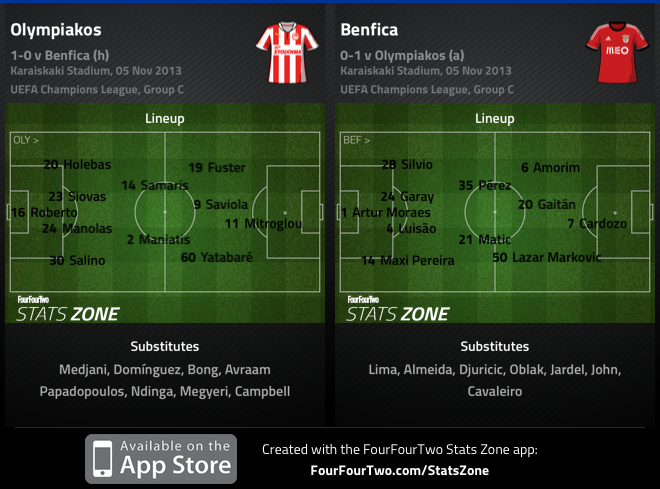 On the wings Gaitán took to the left and Markovic (nominally) to the right, with Cardozo up front. Comparing to last season, when Benfica traditionally defended in two banks of four, this was a much more organised side and the match - if not the result - in Athens seems to prove Jesus' confidence in the team's evolution. Even though Benfica did not start the match pressing high up, they did however showed tremendous composure and timing with their pressing. With Olympiacos arranged in a 4x4x1x1 (with former Benfica forward Saviola off Mitroglou), they reverted to the traditional two banks of four, but seemed incapable of doing anything to build out attacks from the back. Therefore, Benfica allowed the Greek team's centre-backs time on the ball and pressured the midfielders instead, waiting for the long balls aimed at Mitroglou and Yatabaré. Olympiacos right winger was in fact one of the main reasons why Benfica spent most of the time attacking down their left, particularly throughout the first half. Yatabaré would often leave his place on the right to try to pressure Sílvio, but that action left an easily circumvented hole in the Greek four-strong midfield band. The society of Sílvio, Ruben Amorim and Gaitán contributed numerous passes and assists for what should have been Benfica's advantage, only for Roberto to frustrate all of those endeavours (much to Jesus' despair), effectively redeeming himself from the late, soft goal he conceded at the Luz a fortnight ago. 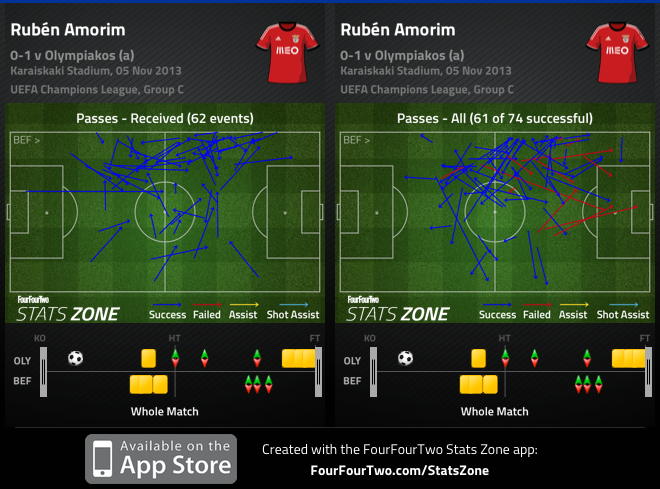 and headed the two most frequent passing combos of the match. There were several reasons for Benfica's dominance. For one, Matic played in the role he excelled last season. As a sole holding midfielder, he was able to dictate the tempo of the match and act as the revolving door in Benfica's build-up play, making simple, piercing passes towards his team-mates. Compared to when he plays higher up (usually when Fejsa plays as the team's anchor), Matic finds himself too crowded in a sea of legs, with less time to make up his mind. On the other hand, Ruben Amorim offered the definitive piece of evidence that he may just be the missing piece in the side's puzzle, offering an incredible work rate and invading enemy lines with his slick movement and wonderful passing. Together with Gaitán and Sílvio, they terrorised Olympiacos' right flank almost through the whole match. but he was also discerning with his passing. Gaitán was a constant threat, either through his dribbling or his crossing. Having already forced Roberto to two great saves on 5 and 8 minutes, Benfica looked a bit vulnerable down the right. With Markovic seemingly uncomfortable stationed on the right, the Serb often drifted inside to look for more time on the ball. Consequently, he was often nowhere to be found, which meant Máxi Pereira sometimes found himself too busy. While the goal stemmed from strange zonal (a term mistaken for static, on this particular instance) marking in a corner kick, it was only natural that the play that led to it was a direct consequence of Benfica's (few) struggles down that side. In fact, even though he managed to improve during the second half (by virtue of playing nearer the centre), Markovic was often somewhat anonymous, the odd zigzag notwithstanding. Markovic did not play his best football last night. Despite the blow, Benfica stayed positive and went on playing their best football thus far, with neat combination play and well-drilled moves. Contrary to what had happened until Olympiacos' goal, Cardozo started leading the pressing higher up, trying to catch the opposing centre-backs in possession. Along with the Greeks' less than impressive defensive display - namely between the lines, where Amorim and Gaitán often appeared totally unmarked -, it allowed the away team to create chance after chance, albeit to no avail. The difference in the teams' approach could not be clearer. Olympiacos were never able to build anything from the back. Benfica were clearly the dominant side here. While listing all of Benfica's chances would be tiresome, suffice to say that the Lisbon-based side did more than enough to bag the much-needed three points. On the back of this display, Benfica supporters must feel a whole lot more confident about what the season has to bring, and maybe the Europa League (if the worst case scenario does come to pass) can offer a better setting for the team to reveal their full potential. As far as the league is concerned, a side firing on all cylinders like they did last night will definitely be a nuisance for dithering FC Porto.